What do students do in the Ultrasound RV? 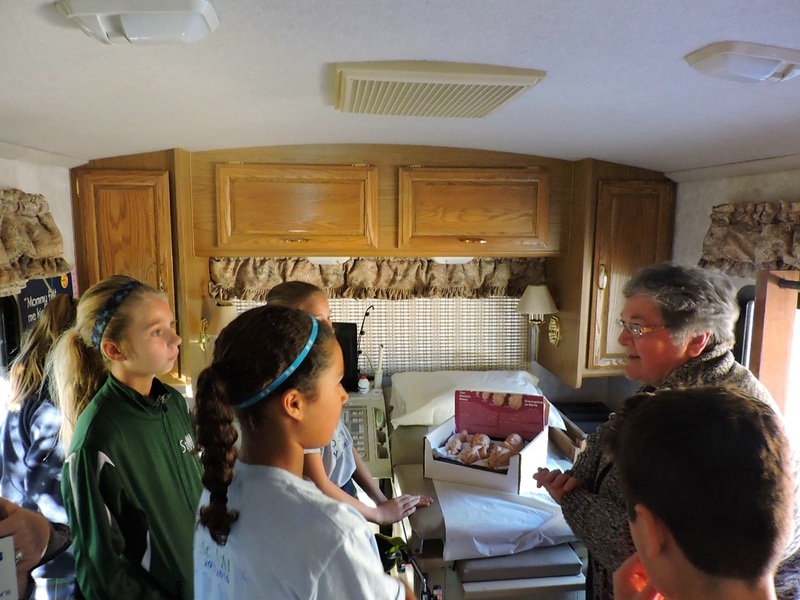 Typically there is room for 10—12 students on the ultrasound RV. Half of those students are in the back portion of the RV with the ultrasound tech and pregnant volunteer viewing the live ultrasound. The other half of the students are in the middle portion of the ultrasound RV where there are tables and chairs. These students can view fetal models and learn more about the development of the baby, discuss other pro-life topics, or help with making the Pro-life Prayer Pillows. Ann Marie Bowen, director of Nebraskans' United for Life, or a trained pro-life volunteer, leads this portion of the presentation. We work with your school in order to provide what you feel will work best for your students here. Students will then shift places—the group that is viewing the ultrasound will now go to the middle portion of the RV and vice versa—so that all students have the same experience while in the ultrasound vehicle. We have two wonderful pro-life, professional sonographers who administer the ultrasounds: Sheila Protaskey and Kathy Havranek. Sheila Steinaurer Protaskey is the oldest of 10 children born in Omaha, NE. She has been married to her highschool sweetheart for 46 years and has two sons and two grandsons with a granddaughter (according to ultrasound) on the way. Sheila was blessed to be a stay at home mom, but then chose to attend Methodist College at age 46 and graduated with a degree in Diagnostic Medical Sonography. She worked as an ultrasonographer with her brother, Dr. Nick Steinauer, and the other physicians at Omaha OB/GYN for 19 years and has just recently retired. As a ultrasonographer, she feels blessed to have had the privilege of sharing with parents that awesome first image of their child. Whether that image be at 5 weeks or 40 weeks, that beating heart is a miracle—God’s gift of life! Kathy Havranek has worked as a Registered Diagnostic Medical Sonographer in Omaha for 30 years, specializing in Obstetrics. She is delighted to help teach the truth of the beauty of life in the womb using the technology of ultrasound. Who are the pregnant Volunteers? When a presentation is scheduled, we network with parish pro-life groups, pro-life organizations, OBGYN offices, and friends in order to find pregnant women to volunteer their time to receive ultrasounds. Volunteers are typically 10– 30 weeks gestation. Volunteers have verified healthy pregnancies and understand that the ultrasound is being utilized for educational purposes. Actual ultrasound image seen by students of baby "waving". Mom chose to find out in front of students that baby was a boy. Volunteer, Sheila O'Connell sharing fetal models and fetal development with students.